Illegal immigration admittedly puts a strain on our resources in the form of overburdened welfare related and education services. The federal government’s immigration policy continues to be muddled by competing political interests, so that no make sense policy is able to be enacted. What this has left us with is a status of individuals who are made illegal, not really by any evil intent on their part, but by an arbitary formula with no basis in reality. The very fact that someone is illegal, as opposed to being allowed to be legal, has cost consequences of its own. Bad immigration policy has also made terrorist events such as the 9-11 attacks possible. Indeed, our porous borders have been revealed to the world as a great security risk. Foreign warriors intent upon attacking our country now only need to come in, basically obey the law, blend in, and they will very likely not be caught. So it isn’t just a matter of zenophobia: it’s a matter of prevent metropolises from being vaporized. I don’t fault most of the aliens themselves. They usually are fleeing from either severe economic poverty or significant political oppression, often, oppression either winked at or created by the United States. The lion’s share of the immigration problem is a problem of government, both the government in this country and the government from which these people flee, and if there were not such government interference in, and control of, the economy, the devasting effects of immigration would be nearly non-existent. Were it not for government interference and mandates and red tape with the employment process, and were not for the poor quality of education that governments have instituted in too many places in this country, making many high school graduates unhirable, and if potential American workers were not encouraged out of the job market with welfare, there would not be as great a demand for immigrant work, and what demand did exist would be a net benefit to Americans. The federal government has a responsibility to fund any madates it forces states to undertake because of its own policies. States should determine ways to withhold state funds from the federal government or attach and foreclose on federal property if they refuse to fund their own mandates. I would also search for legal ways in which to bill a national’s country of origin for his expenses incurred while illegally in the United States if that country has not adequately sought to stop its flow of illegal emigrants. We must determine what is realistic and what is fair, not just for the potential immigrant but for the citizens of this country. We have to examine, to what degree in a free society, a border can be controlled. We have to examine precisely what is reasonable in the area of whom we should allow to be legal. And there are situations beyond our borders which involve foreign policy decisions that must be addressed. MAKE LEGAL WHO WE CAN – I really have a problem with the concept of this federal govenment allowing immigrants into this country through porous borders yet denying them legitimacy in the eyes of the law. It is not only an unfair double-standard but it is the root cause of most of the difficulties we have with immigration, and results in victimization of these people by both government and criminal elements. ELIMINATE THE CURRENT NATIONALITY FORMULAS – They are wholly unrealistic. Currently the number of slots alloted for immigration into this country by country of national origin bear no relation to the demand for those slots. This results in open slots for some countries, and very crowded demand for slots from other countries. As a result, nationals of certain countries find themselves more often than not in a situation where they are inevitably destined to be illegal. The best thing to do with these national origin quotas is to eliminate them entirely: give everyone in every country an equal chance to reside here. If any favoritism is to be shown at all, it should be with countries with which we share a common border or close proximity, such as Mexico, Canada, Cuba, Jamaica, Haiti, the Dominican Republic, etc. 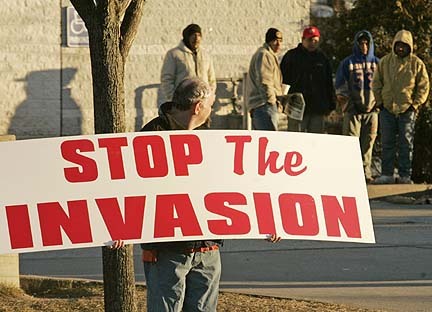 IF THEIR SUPPORT IS GUARANTEED, LET THEM IN – If a person is fully capable of supporting himself, or his family, or if someone else agrees to take binding contractual responsibility for them to pay for all the expenses of the immigrant, generally they should be allowed legal status in my opinion, barring a compelling reason for denial, such as criminal history or emigration from a state sponsoring terrorism. PROPERTY OWNERS -We must admit aliens into the country who own real property here for the purpose of their having access to and residence upon their land, unless there is a compelling reason for denying them entry. EMPLOYMENT – I believe that generally, aliens who have been hired or guaranteed employment by a legitimate American employer ought to be admitted, so long as the employer has contractually agreed to hold the taxpayers harmless for any expenses those aliens and their accompanying families might incur, like medical and educational expenses, and so long as that employer pays a fair, living wage. And such admission should be for the length of their employment. While I agree that some foreign immigrants take jobs that Americans should have, often, companies cannot find adequately skilled individuals from this country, largely due to the decrepit public education system this country has. SECURE BORDERS USING THE MILITARY AND THE MILITIA– We should use our military, our National Guards, and private citizens formed as the Unorganized Militia, to patrol our borders and ports in areas where our immigration law is being continually violated, as every other nation on earth does. The States of California, Teaxas, Arizona, and New Mexico can direct its own National Guard to protect the southern U.S. border without federal permission. Members of the Unorganized Militia may independently defend the border of the United States. Current law and judicial decisions mandate that localities must bear the burden of illegal immigrants and even non-residents using government services. While I do not believe a locality or a state should be prohibited from serving these people, I also do not believe they should be compelled to, and this is the case most of the time under federal law or judicial mandate. Non-citizens should be ineligible for any federal or state government-funded program into which they have not paid, including welfare, unemployment compensation, and Social Security, with the exception of preventive and emergency medical care and the K-12 education of non-citizen children. Individuals in need of medical treatment often can be carriers of disease, and diseases respect no national status: an untreated person can become a danger to the community. And as a responsible fiscal measure, we should not allow medical disorders to progress to the point where they require expensive emergency treatment. Why education? There really isn’t an alternative. Some schools and some school districts will not want to educate illegal immigrant children, and I respect that right. Others will, and since I believe in Complete Parental Choice, providing such a plan was already in place, I would allow choice by the schools and the school district as to whether or not they wanted to educate undocumented immigrants. Under Complete Choice, private schools will develop to serve the special needs of some immigrant children, and immigrant children will not lack an education. Any alien having been convicted of a felony within the U.S., or discovered to have been convicted of a crime equivalent to a felony elsewhere, should be deported and denied entrance into the United States forever. During the current state of emergency, I believe that no more immigrants from Muslim dominated countries should be accepted, without a compelling reason, such as marriage to an American citizen or the receiving of needed medical treatment. I also believe that all visas from countries which are predominantly Muslim should be immediately subject to revocation. We have a very serious set of loopholes on asylum requirements which allows terrible abuse of the system. I would change the rules so that an alien is not considered present in the country simply by deplaning at an international airport or by being docked on a ship in an American port. I would limit asylum qualification to definitive danger of death, torture, mutilation, and substantial abuse of the applicant alone: an applicant’s family would also have to be in similar danger for them to gain asylum. The application process should be shortened to three months. Moreover, we should provide for the revocation of asylum when the circumstances in the applicant’s home country change radically and the danger to them has been removed: asylum revokees of course should be allowed to apply for legal residency and citizenship. I do consider the practice of female clitoral castration, sometimes called female circumcision, to be a barbaric practice which qualifies anyone under threat of it to be a legitimate asylum candidate. Usually, this is a thing done in Muslim African countries. I am prepared to make mutual open admission treaties with any nation, acknowledging that a citizen of their country may emigrate here under the same conditions that an American citizen may emigrate there. Work rights, business ownership and property ownership rights must be equal. I also have no problem with dual and multiple citizenships, and believe the United States should accept such so long as citizens of this country are granted those rights in the other country. We cannot use the excuse of illegal immigration to impose broader state power upon American citizens. This should not become the Soviet Union. Unfortunately, under the Clinton regime, we as a nation are being to resemble a dictatorship as opposed to a free republic. Therefore, I oppose the implementation of a National Identity Card, and I oppose as well the continued compulsory use of the Social Security Card as a reqirement to work in the U.S. I oppose any restrictions or suspension of civil and human rights upon Americans brought about for the purpose, real or supposed, of fighting illegal immigration. And I want the immigration laws concerning employers clarified so that employers innocently hiring illegals are not penalized: in my opinion, the I-9 laws are too oppressive, largely irrelevant, and commonly used to justify discrimination. We need to recognize that a serious problem exists with the country of Mexico, and that the Mexican government, through its socialist, mercantilist economic policies which enforce poverty on so many of its citizens, is the chief cause of the problem. In the last few months, there have been border skirmishes between Mexican federal troops and the INS with shots fired and hostages taken. Mexico refuses to police its citizens from illegally entering the United States, and often encourages illegal immigration. Not only is there a problem with Mexican refugees, but the Mexican border has become a common entry point for agents who would engage in terrorism within the United States, and an identical problem exists on the Canadian border. We should immediately cease all aid to Mexico, until they enact serious democratic and free market reforms. In general, we should not aid countries who persist in excessive regualtion of their economy and their citizens’ right to conduct business. Also, I believe the U. S. Armed Forces, National Guards, and private citizens operating as the Unorganized Militia, should be brought to bear in this situation on both borders. Additionally, there is a movement by certain activists to promote an “Aztlan movement” seeking to willfully infiltrate the U.S. for the express purpose of establishing a new regional government dominated by Mexican emigrees. While I am sure the majority of Mexican Americans would want nothing to do with such a movement, and while I fully support the rights of people to secede from the United States or the several states, there are aspects of this movement that resemble a deliberate invasion to attempt to establish an enemy government. I don’t believe we should act in haste, and assuredly, we should not seek to paint Mexican-Americans unfairly because of this. Notwithstanding, this is a situation requiring further study and vigilance, because it has the potential of turning into a situation which could break into warfare.